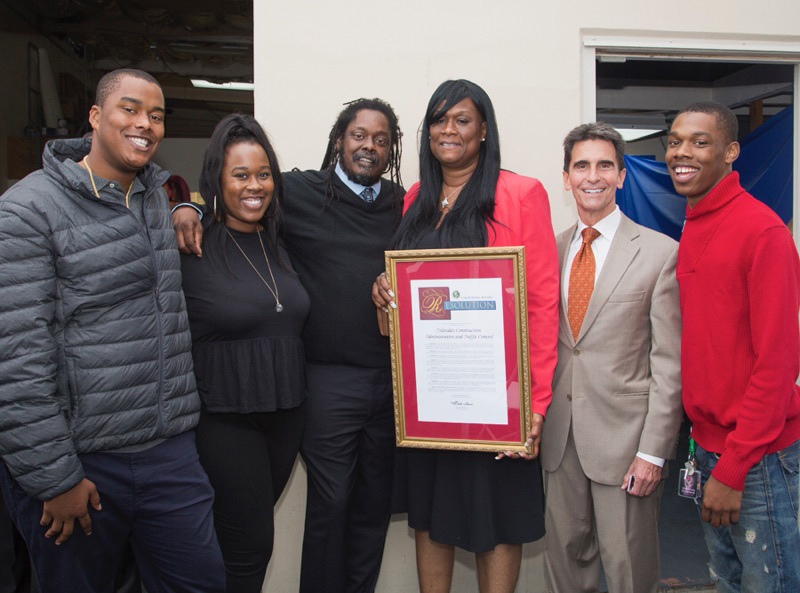 The whole family celebrates the honor bestowed on Yolanda’s YCAT-C: from left, her son Raysean Jones Jr., daughter Lyn-Tise Jones, husband Raysean Jones Sr., Yolanda Jones, Sen. Mark Leno and son Rome Jones. Yolanda’s Construction Administration and Traffic Control, Inc., was given a proclamation honoring YCAT-C as “Small Business of the Year” at a special ceremony, Thursday, Oct. 27, at YCAT-C’s Bayview Hunters Point headquarters in San Francisco’s Industrial Park. Sen. Mark Leno, D-San Francisco, honored YCAT-C’s CEO Yolanda Jones with a special proclamation, in recognition of her achievements and commitment to hiring locally. “Yolanda is an inspiration to me, her family and her community, to which she is 100 percent committed. When Yolanda succeeds, we all succeed,” said Sen. Leno. Jones, a Bayview Hunters Point native, founded YCAT-C in 2010 and has since grown the company from a three-person staff to a 22-person staff. Jones has since employed 40 people from Bayview Hunters Point, earning a reputation as a community champion, philanthropist and strong local employer. Jones, a Bayview Hunters Point native, founded YCAT-C in 2010 and has since grown the company from a three-person staff to a 22-person staff. Jones has since employed 40 people from Bayview Hunters Point. “Last year, my husband and I were both unemployed. My husband was part of the union were Yolanda recruited workers. She hired him, and soon after meeting me and learning our story, she hired me too,” said Maria Lopez, a resident of the Sunnydale neighborhood in San Francisco’s District 10. YCAT-C is a woman-owned local business enterprise (LBE) offering a range of administrative and traffic control services for engineering and construction projects. YCAT-C’s staff holds extensive experience supporting high-profile infrastructure projects throughout the Bay Area. YCAT-C’s portfolio includes work in the transportation industry, specifically rail transit and highway projects. As a local business, YCAT-C holds strong partnerships with the local supplier network. YCAT-C now has offices in Richmond and Oakland as well. For more information about YCAT-C, visit ycat-c.com or call 415-647-2682. Kia Croom is a journalist with more than a decade of experience writing for publications in California and across the country. Follow her on Twitter at @newsbykiac or email her at kianews2011@gmail.com. Yolanda Jones, CEO of YCAT-C, is awarded a proclamation naming YCAT-C Small Business of the Year by Sen. Mark Leno. Yolanda Jones has never shied away from working hard and taking big steps with her business. She set a goal in her first year of owning Yolanda’s Construction Administration and Traffic Control (YCAT-C) to increase its revenues tenfold. YCAT-C supports and manages construction sites across the Bay Area and provides dozens of jobs to local residents. The company has grown to three locations with the head office in Bayview Hunters Point. The neighborhood has been one the most marginalized areas of San Francisco with low incomes and crime problems. Jones is dedicated to being a vital part of the solution to helping the area and the Bay Area by creating well-paying jobs. Lebron James amplified her efforts for exposure and job creation in this area with a shout out on Twitter earlier this year. Lebron James amplified her efforts for exposure and job creation in this area with a shout out on Twitter earlier this year. Jones believes that she is constantly learning as her company grows. She is continuously seeking opportunities to improve and grow her business. The ICCC executive education sessions helped her understand what capital providers were looking for and how to tell her company story better. She secured debt financing after ICCC and is able to win bigger contracts with corporations such as Xerox. Her clients continue to return to her company for the high quality of work YCAT-C provides, and Jones knows that she can continue to expand her client base moving forward. Jones is on target to add over a dozen employees next year as further projects begin and she continues to expand her work around San Francisco. Since ICCC, her revenues have increased by 151 percent. 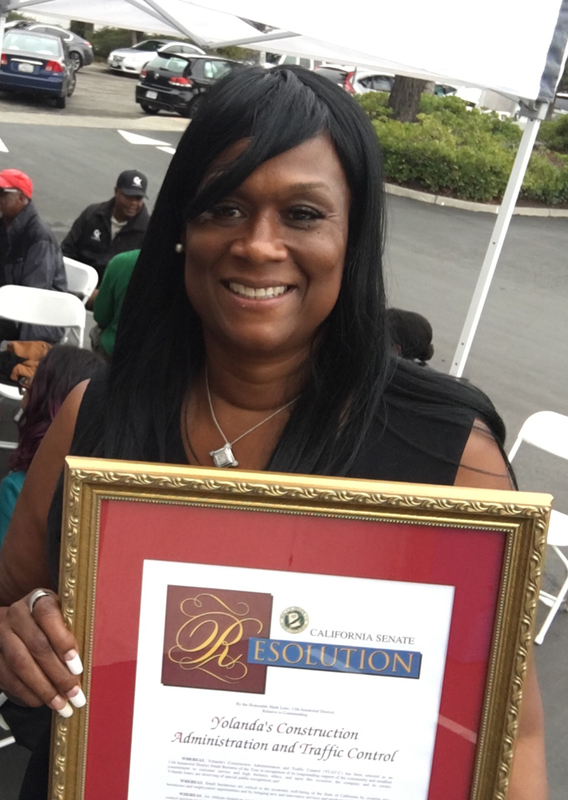 For her efforts, Jones received a proclamation celebrating her achievements as a San Francisco small business of the year in a presentation with state Sen. Mark Leno in October. Kieran Bunting, an analyst at Inner City Capital Connections, can be reached at kbunting@icic.org. This story was featured in the 2016 Inner City Capital Connections Impact Report. Next articleCan Oakland fix the homeless crisis it created? In this picture all of the successful people and they got a new certificate from the Esolution Company. That’s really good your all team celebrate your success and also share your fans.